Washington Nationals fans have all seen the spectacle, the fourth-inning “race” featuring the Mount Rushmore mascots: George Washington, Thomas Jefferson, Abraham Lincoln and Theodore Roosevelt. They trot around the stadium wearing period costumes and huge caricature masks. Hilarity ensues. 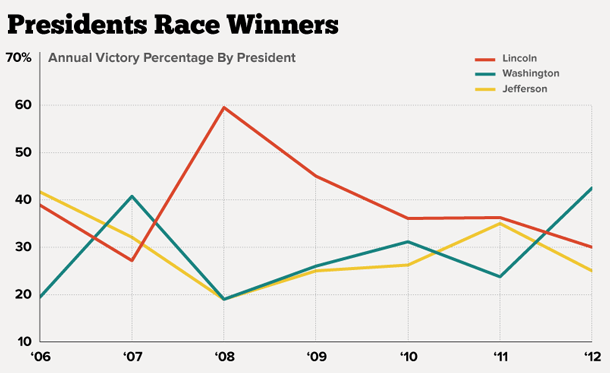 The first three presidents in the last seven seasons have had their fair share of wins in the races, which are known for hijinks that make their outcomes unpredictable. The latter president, a man remembered for his “robust masculinity” and adventurous spirit, has been (tragically?) shut out. He just can’t seem to win, no matter how much of a lead he takes from time to time. He gets distracted, or someone trips him, or he fades — or something else prevents him from crossing the finish line first. WHY, though, can’t Teddy get a win?? These word trees, made with Many Eyes, parse the short highlights of each contest since 2008 released by Let Teddy Win, a blog devoted to the races. Using the interactive version, you can search for specific words or phrases and see words around them in context. Someday he’ll win. I just hope I’m there to see it. * Excluding “ties,” non-presidential mascot winners and extra-inning bonus races.